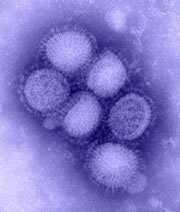 A Presidential advisory group of the nation’s leading scientists and engineers today released a new report assessing the Obama Administration’s preparations for this fall’s expected resurgence of 2009-H1N1 flu and outlining key steps officials can take in the coming weeks and months to minimize the disease’s impact on the nation. The Federal Government’s preparations for 2009-H1N1 flu have been well-organized and are scientifically grounded, according to the report by the President’s Council of Advisors on Science and Technology (PCAST), which assembled a subcommittee of experts on influenza and public health for the purpose. (PCAST is an independent group of leading scientists from academia and industry administered by the Office of Science and Technology Policy in the Executive Office of the President.) But some aspects of those preparations could and should be improved or accelerated, the group concluded. The report concludes that the 2009-H1N1 flu is unlikely to resemble the deadly flu pandemic of 1918-19. But in contrast to the benign version of swine flu that emerged in 1976, the report says the current strain “poses a serious health threat” to the nation. The issue is not that the virus is more deadly than other flu strains, but rather that it is likely to infect more people than usual because it is a new strain against which few people have immunity. This could mean that doctors’ offices and hospitals may get filled to capacity. Among the group’s prime recommendations: accelerate the preparation of flu vaccine for distribution to high-risk individuals; clarify guidelines for the use of antiviral medicines; upgrade the current system for tracking the pandemic’s progress and making resource allocation decisions; accelerate the development of communication strategies—including Web-based social networking tools—to broadcast public health messages that can help mitigate the pandemic’s impact; and identify a White House point person with primary authority to coordinate key decisions across the government as the pandemic evolves. An overarching message of the new report is that through their behavior, individuals can have a potentially big impact on the flu season’s severity. Frequent hand-washing and staying home from school or work when sick will be crucial. The report recommends intensive public education campaigns to reinforce those key behaviors, and also calls for policy adjustments that can reduce economic and other incentives that might encourage people to risk infecting others. For example, workplaces could liberalize rules for absenteeism so employees don’t feel pressured to come to work when sick and school districts could arrange alternative means of distributing lunches to children who are sick but who normally depend on school meals for adequate nourishment. The full text of the report can be found here (pdf). PCAST Recommendations and Administration Progress can be found here (pdf). Professor Racaniello, is there a reason why Brazil can only have 503 confirmed deaths so far in its winter flu season and yet this report predicts 30 to 90 thousand in the US's coming one? Is there an epidemiological reason why 2nd waves of pandemics infect more people and if so is that why their prediction differs from the Brazilian picture? the 36000 estimate from seasonal diversity in overall mortality. in Australia during July,August ?